“[. . .] craziness and brokenness are so vital to a story,” Katy said on Monday’s post. We’re just so human. Try as we might to be otherwise, what with our Christmas newsletters and greener than green front yard lawns, we can’t escape our messy, confusing human state. Enter fiction where, for once in our ever-loving life, we’re allowed to pull back the thin veneer of straight teeth and gold stars at kindergarten, and look straight into the bubbling pot of messy humanity. Really have a good look. Poke around in there, sniff the dirty socks, and cry a little when the way the character breaks apart looks so much like the way we’ve broken apart. There’s no way around this fact (even when, as parents we fool ourselves into thinking it won’t be that way for our children, that if we keep them whole long enough they will stay that way for life). Somewhere along the way life tossed you like a toy, and something about you broke. 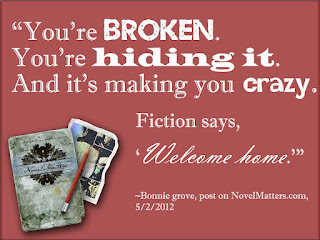 Enter fiction where for once there is someone who is broken and lost and confused and getting it all wrong. Just like us—but just enough not like us that we can bear to look deeply and brush up against our ache. Really feel it, and accept it as part of our experience, part of what makes us who we are. Part of our personal crazy. You are home to personal craziness. There is a part of you no one understands—not even you. The fear that wakes you in the middle of the night and pushes you out of bed, down the hall, to check the child sleeping in the other room even though that child is grown and hasn’t slept in that bed for twenty years. The way rain makes you laugh, and how mowing the lawn reminds you of the six weeks you spent with your leg in a cast, and how you can’t remember your Grandmother’s maiden name and that makes you cry. And how you can’t explain any of it to anyone because it doesn’t make sense. Enter fiction where we find characters that speak the language of our silence. Who ask the same questions our hearts have been wordlessly asking for years we just didn’t know it until we found the story that asked the questions. Fiction is the story of you living a different life in order to be able to see yourself in a new way and make sense out of the life you are living. And it’s making you crazy. Ooh, ooh! "Fiction is the story of you living a different life in order to be able to see yourself in a new way and make sense out of the life you are living." LOVE!!!! So much truth in that! 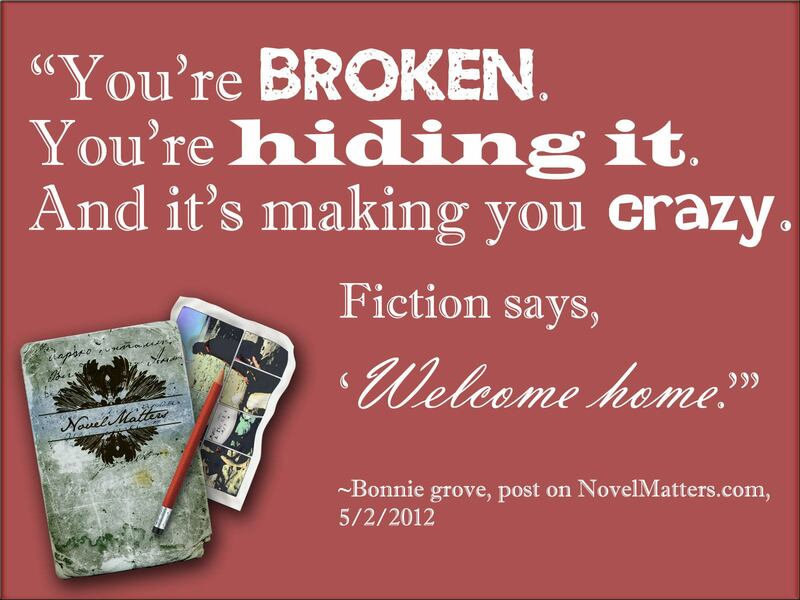 Yes, Bonnie. You have a round truth here. "Make it funky...if you can find God in the funk and the mud, then you got it." Enter fiction where we find characters that speak the language of our silence. Isn't it fun when people quote your stuff back to you? :D So good, Bonnie! SO good! Very poignant, Bonnie. Your line about not remembering your grandmother's maiden name making you cry really touched me. I do remember my grandmother's maiden name, remember how much my grandmother meant to me all my life, and I guess that's what got to me. But it's lines like that, that truly come from the deep places within us, that reach out and touch an unsuspecting reader. Who knows why, in that moment, it touches and touches deeply. It just does. And it connects us -- reader and writer -- and I love that. Karen: It's a neat way of looking at the book you're currently reading, AND the one you're writing. Susie: Well, to be called half the smarty-pants as Luis Alberto Urrea is a day maker. Thanks. Wendy: Very fun. Thanks so much! Sharon: There's this great "who knows why it touches deeply" thing about fiction. An electric magical something so human, yet so divine. Bonnie, you're a master. Or... a mistress. You amaze me. This is good writing. I'm a little ashamed to say I found that phrase in Eat, Pray, Love...but I did. And sometimes, just maybe, the author can touch more people through a book than if they opened a counseling couch. Katy: Any points I scored are because I was inspired by your wonderful post on Monday. Thanks for being you. thebeautifuldue:Those Italians. They have a different word for everything. It did bear repeating--we're always glad when you drop by, John. Cherry: So much cheaper! And likely more helpful, too. Early teens, messy bedroom, paperback copy of Never Miss a Sunset, and sudden floods of relief and understanding that somewhere a fictitious girl felt just like me. Thanks for putting it all into words. Bonnie, wonderful post. I love those last lines too. Never more true for me than the book I'm writing now. Maybe that's why it's been more of a struggle than any before. Cherry, I couldn't agree more. Novels can be both self-help and therapy for me. I'll take it even further and say that certain novels that have spoken to my "personal crazy" have been as good as discipling. The author is showing me, not telling me, how to live this life of walking with God through a world that so often tries to knock us off that path. wanderer: Lovely, dreamy memories there. Thanks for sharing them with us. Lori: The more personal the story, the more universal it is, I think. When we are able to touch the places inside ourselves we tend to hide from others, we touch that place for so many other people, too.